Activists participate in a Release the Report rally in Times Square on April 4 in New York City. First came the wait for special counsel Robert Mueller to conclude his investigation on Russia's interference in the 2016 presidential election. 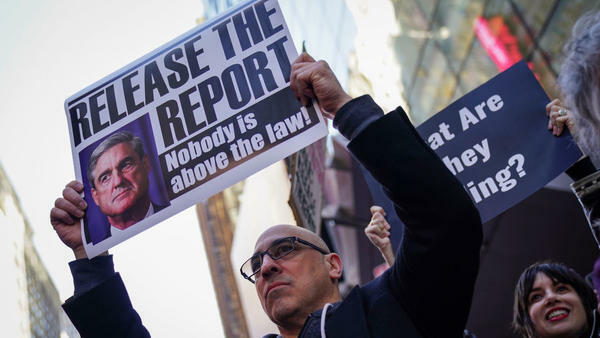 That happened three weeks ago, but after Attorney General William Barr released a four-page summary of the nearly 400-page report, there has been a new anticipation — and growing acrimony — for the report to be released to members of Congress and the public. But even when the report is released, it's unlikely the politically divisive debate that has been the hallmark of President Trump's tenure in office will be resolved. Barr's summary letter on March 24, two days after Mueller delivered his report to the new attorney general, was met with glee from the White House, as he wrote that the lengthy investigation did not find that the Trump campaign "conspired or coordinated with Russia in its efforts to influence the 2016 U.S. presidential election." The president and most Republicans saw that rundown of Mueller's major findings as "complete and total exoneration," even though Mueller did not take a position on whether Trump obstructed justice, given his comments and actions around the ongoing investigation. Rather, Mueller's team wrote, according to Barr, that "while this report does not conclude that the President committed a crime, it also does not exonerate him." Barr and Deputy Attorney General Rod Rosenstein, however, concluded that Mueller's finding were "not sufficient to establish that the President committed an obstruction-of-justice offense." But given what little Democrats have seen of Mueller's findings, they want more answers on exactly how the Justice Department came to that conclusion. Barr said he would release more of the report but would need time to make the necessary redactions before it could be made public. Key House Democrats didn't want to wait and had initially demanded it be made public by April 2. But Barr responded, saying he thought he could complete any redactions by "mid-April, if not sooner," and the release anticipated for this week does hit that promised timeline. However, soon after that update from Barr, the House Judiciary Committee, along a party-line vote, authorized a subpoena for the full report and its underlying investigative evidence. Barr has said he's willing to testify before the House and Senate judiciary committees in early May. Barr was on Capitol Hill last week testifying before a panel of the House Appropriations Committee on unrelated budget matters, and he was clear that he didn't want to talk much about the Mueller report — but Democrats certainly did. The attorney general indicated that he would be open to negotiating with congressional leaders who want to see Mueller's underlying evidence once the report is released. Then, the next day, before a panel of the Senate Appropriations Committee, Barr stoked a whole new controversy when he said he'd launched his own informal inquiry into the origins of the FBI's initial counterintelligence investigation into Russia and the 2016 Trump campaign, which began the summer of that year at the height of the White House race. Trump has often pointed to this as evidence of bias, and Barr seemed to concur, saying that "spying did occur" on the then-nominee's campaign — a claim Trump has regularly made without evidence. Later in the hearing, Barr clarified that he has no "specific evidence" of such surveillance but that he has "questions about it" and "concerns about various aspects of it." What else could Mueller's report reveal about Trump and Russia? After Barr's letter, what more does the public want?